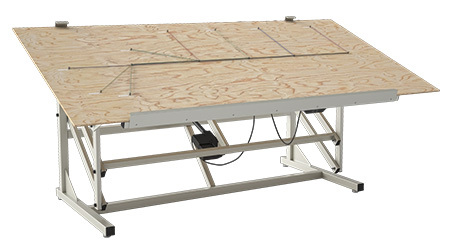 This tilting board frame uses electric height adjustment and manual tilt from 0 to 90 degrees in ten-degree increments to allow workers to reposition harness boards easily without disturbing work in progress. 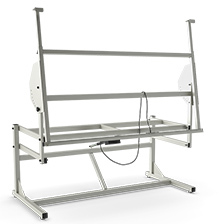 The frame can support boards up to 96"W x 48"D in a position that allows for sitting or standing, facilitating high productivity and good ergonomics for an injury-free workforce. Depth x Width: 36" x 72"
Height Range (Vertical Position): 11" to 46"
Height (Horizontal Position): 36" to 70"